You’ve made Thanksgiving pie, it looks beautiful, and you have a small handful of pastry offcuts left, now what? Let me tell you what… you need to grab 3 simple ingredients and roll out this to-die-for treat (it might even taste better than your pie). Warning: Once you try this scrumptious little morsel you will never wonder how to use up leftover pastry scraps again! My Mom has made this forever and a day. She is master pie maker and when you have 6 starving mouths (not starving really we were chubby kids) standing at the stove waiting for something sweet you figure out a way to shoo them off. 1. Roll out pastry. Generously spread butter all over. Sprinkle with brown sugar and cinnamon (don’t be shy). 3. Put in a parchment lined pan, and place in the oven next to your pie. Bake until slightly brown and oozing with brown sugar (about 25 mins on 350). 4. Allow to cool a few minutes, slice into discs and serve. You can make this delicious cinnamon roll with as much or as little pastry as you have left over. I’m not gonna lie I’ve even just made one with a whole batch of pastry! 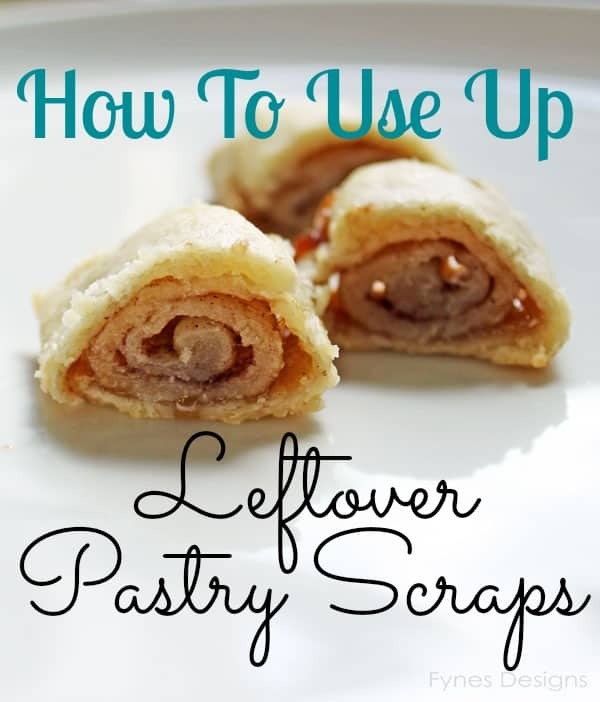 How do you use up your leftover pastry scraps? My mom made these as well! My mother used to do the same thing with leftover pastry but she managed to get a cinnamon gravy to cook along with it. I am not sure how she did this, don’t remember back that far, but I am thinking she just poured water over it and it just thickened with the butter, cinnamon sugar and flour of the pastry roll. I have made your version for my husband who loves crust, but not pie. I know! My mom made a version of these too! She baked them flat with butter, cinnamon and white sugar. She scored the pastry before they went in the oven so it would break apart easier. They kept eight sets of little fingers out of the pies before Dad came home for supper! The best part of the pie, in my opinion! Totally the best part of the pie, YUM! Ahhhhh….. Memories of my “grand-maman”! This is a French Canadian favourite…. We call them “pètes de soeurs”, which translates as “nun’s farts”… I know…. Don’t ask… :-)))). Mmmm, I love anything with pastry! My mom used to sprinkle cinnamon and sugar on pastry scraps and make ‘cookies’. Yum yum! That looks absolutely delish! I love all-things-pastry and am a huge cinnamon-and-sugar fan. Definitely going to do this the next time we make pastry! Looks yummy! Cinnamon and you had me sold. This is a GREAT idea! Doing this next time I make pastry. Thanks for sharing. Oh my! I think I need to eat one of those right now! I might have to make a pie just to get some scraps! yummy – I am completely going to try this – but maybe with new pastry because I want to experiment with gluten and dairy free pastry soon! Thanks for the inspiration! My mother-in-law made pastry and made big ones for my husband, if he was sick as a child. He calls them “piggies” why I don’t know but I make them for him now when he is ill. Thanks. Its so nice that you have a special yummy treat when your man is feeling down! That looks delicious. Last time I had scraps I made little apple popovers, but this is even easier. Thats a good idea Teri! My mom made these and I now make them for my grandkids. We cut ours first then bake them. Always a treat !! And we call them pigs !! These are a tradition in my family. Great Grandma, Grandma, Mom and I all make these. We cut them into 1 inch pieces before baking, a little of the filling mixture creeps out and crystalizes – YUM! This is the best part of making pies! I know, I’ve actually made a pastry batch just to make these. The crystalized sugar is soooo yummy! My mother made these and now I make them. 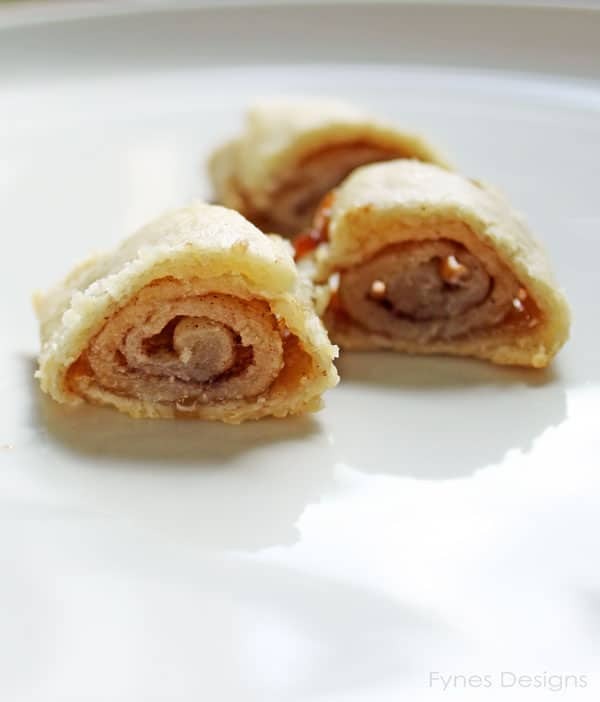 Every time I make these mini cinnamon rolls, it brings back fond memories of my childhood. What a great idea! These look so yummy too. Thanks for linking up with us at the #HomeMattersParty and I hope you’ll join us again!